PLEASE READ THESE TERMS CAREFULLY AND COMPLETELY. WE RECOMMEND THAT YOU PRINT AND KEEP A COPY OF THEM FOR REFERENCE. shall mean the person, firm, company, local authority or any government department from whom the Buyer receives an order for goods or services. The expression “Goods” shall mean articles, things, materials, professional services or commodities or any of them described in the Order. The expression “Specification” shall mean the technical description of the Goods contains in or referred to in the Order. The expression “Order” shall mean an Order placed by the Buyer to the Seller for the sale of the Goods. 2. These conditions contain most obligations between the Seller and the Buyer. No variation of these Conditions shall be binding unless made in writing and signed by both the Seller and the Buyer. The headings covered in these Conditions are for reference only. All orders for goods which are readily available from either our own stock or that from one of our suppliers will fully adhere to the Consumer Contracts (Information, Cancellation and Additional Charges) Regulations 2013. These regulations entitle you to cancel an order at any time up to 14 working days after the day of delivery. To do this please just contact us. It is better if you can email or write to us, as this will enable us to handle your cancellation more efficiently. This will enable us to improve the service we offer to customers in future. If you cancel, you must return the goods to us at your own expense within 14 days. Most orders processed by the Seller are specially made to a customer’s specification and, resultantly, the re-stocking and cancellation charges apply. Please see paragraph below entitled “Cancellation Notice”. This cancellation policy does not affect your legal rights, for example, if the goods are faulty or not as described in the contract or on the applicable invoice. 3. Quotations are only submitted and orders are only accepted to these Conditions. All prices quoted remain open for a period of thirty days from the date of quotation. so that no order shall be binding unless it has been confirmed in writing by the Seller. 6. A) The Seller’s prices rule at the date of an Order. B) If after an order has been confirmed and the Seller’s costs are increased by legislative measures of any government or legislature involving new or additional duties or charges, the Seller reserves the right to adjust the invoice price by the amount of any such increase with the Buyer’s acceptance and the invoice price so adjusted shall be payable as if it were the original contract price. In the event that a higher price would need to be charged, you may cancel the order without penalty. Errors and Omissions are Excepted. 7. A) The date of period for delivery shall be the date or period as stated in the Contract. B) All the Goods for delivery in the UK shall cease to be at the risk of the Seller at the point when the Goods reach the premises of the Buyer and thereafter all such Goods shall be at the risk of the Buyer. 8. The Seller reserves the right to charge a nominal re-stocking charge to cover the costs and expenses of any order cancellation outside the statutory 14 day Cancellation Period outlined above, except for any items that have been made to a customer’s specification. 9. If there is a problem with the Goods, please contact us. We will deal with your concerns in accordance with your legal rights. B) The Seller’s liability in the event of an unsubstantiated claim for non-delivery, partial loss or damage and in respect of Goods which the Seller agrees are not of reasonable quality is limited either to giving the Buyer a reasonable refund or to replace the Goods Under no circumstances whatsoever shall the maximum liability of the Seller for Goods of poor quality or for non-delivery, partial loss or damage exceed the invoice value of the Goods concerned. 10. Please contact us before returning any item. It is the Buyer’s duty of care to ensure the Goods are received back by the Seller in the same condition as they were despatched. We may make a deduction from the reimbursement for loss in value of any goods supplied, if the loss is the result of unnecessary handling by the Buyer. 11. A) If full payment is not made prior to delivery, until payment has been made, the Buyer will keep the Goods that they can be clearly identified as the property of the Seller and are separate from other Goods purchased by the Buyer. 12. A) The Seller shall not be liable to the Buyer for any loss or damage or expense whatsoever suffered by the Buyer due to any cause beyond the Seller’s control including acts of government, acts of war, strikes, lock-outs, riots, fire, lightening, aircraft, transport, explosion, flooding, acts of God, force majeure, illegality, breakdown, accident or theft. 13. The Buyer acknowledges that it cannot assign its own rights under these Terms and Conditions of Sale. All guarantees and indemnities are passed on from the respective manufacturer of the item. Your statutory rights will still apply. We reserve the right to change our Terms and Conditions at any time, so please do not assume the same Terms will apply to future orders. 14. If you need to return your standard stock item, then you can do so at your own cost and must notify us in writing within 14 days from receipt of the item. You then have to return the item to our registered address within 14 days in the same condition as they were received. If you have attempted to install the item, then no return will be entertained. Once we have received the goods back for inspection, we will notify you and shall inspect the item and investigate your reason for return within a maximum of 5 working days (subject to our holidays). We will then notify you of our decision in relation to your refund. If your refund is authorised, this will be transacted by the same method as the item was paid for (card, cheque, BACS, etc) within 7 (seven) working days. If we have supplied the incorrect item, then we shall also pay reasonable return costs, details will be given before an item is returned. 14a. For goods made to a customer’s specification or that are clearly personalised or where any item ordered is adapted specially or bespokely manufactured, the standard regulations for cancellation options do not apply. Cancellation and re-stocking charges up to and including the full cost of the item can be omitted from any refund for any Order a customer wishes to cancel. All applicable re-stocking or cancellation charges will be made aware to the Buyer by e-mail or verbally prior to an Order being processed. Returns may be refused by the Seller for stock or standard orders advised to us more than 14 days after date of delivery. and shall be deemed to have been made in England. 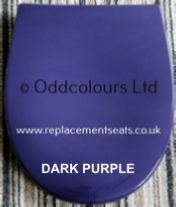 Oddcolours Limited (trading as Bathrooms in Colour / Replacement Seats) is registered in England and Wales. Director: Mr N. Wolstenholme Registered Address: 16 Anson Close, Rugby, Warks. CV22 7HX. Any other information about the Company can be requested in writing at the address above. Information is correct at time of uploading onto the web-site, that being 27th April 2016.